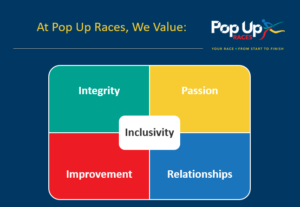 Pop Up Races | A Race Management Company offering a range of tiered services to help race organisers to promote and event manage their races from operations including on-line entry, chip timing to offering experiential extras. Pop Up Races are Ireland’s premier chip timing & event management company. Originally established in 2014 by running enthusiasts Brian and David Conroy, Pop Up Races initial focus was to bring ‘low cost’ 5k chip timed races to towns around Ireland. Our first race was held in Celbridge and had 27 finishers. This year, we expect to cater for over 80,000 runners across 160 events in both Ireland and the UK. Ensuring race organisers are guaranteed an accurate and efficient racing environment. Providing an accurate time for each participant in a race. Our team in Pop Up Races is growing. The individuals hired thus far are people who have a genuine interest in racing events. We’re 100% committed to our employees and therefore they give 100% commitment to the job at hand. Our team of professionals ensure that when the responsibility for race timing is given to Pop Up Races, we aim to exceed the expectations of the race director as well as the athletes.